The PlatformSpecificCode example, which can be found in the Examples directory of the NeoMAD installation, demonstrates how to integrate platform specific code as part of a NeoMAD project. In this example, we want to use the Compass sensor, that is only available on Android, iOS, Windows Phone and Windows. A simple example will just show the magnetic heading value given by the compass. The specific-def folder contains the Java definition of the specific code. This folder and its content are created by the developer. In order for the non-specific code to interact with the specific code, the developer has to provide a definition of what the specific code will look like. This definition is a classic Java class. The specific-impl folder contains the real implementation of the specific code for each platform, that will be embedded into the final binary. 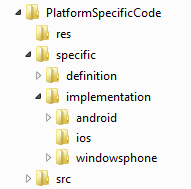 It contains sub-folders that represent platforms for which specific code will be implemented (such as Android, iOS or Windows Phone). The specific-impl folder and its content are automatically generated by the NeoMAD -gsi option, based on the definition. The generated implementation is the exact image of this definition written in the language of the target platform. Then, the developer can complete the implementation files in order to provide the specific implementation of the feature for each platform. These two methods have default implementations in the definition: the isSupported() method, for example, returns false by default. This means that by default, the generated specific implementation of this method will return false for all the platforms. The generated code can be embedded as it is and the functional behavior will remain correct. * every time the compass orientation changes. This generates the default implementation for all the platforms supported by NeoMAD in the specific-impl folder. an implementation class Compass.java; with the same name as the definition class, and extending the generated abstract class, this class will contain the specific implementation written by the developer. For platforms that support the compass, the implementation that has been generated must be completed in order to use the compass with the target platform API. 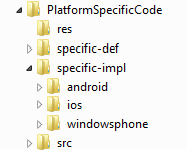 In the example the complete implementation for Android, iOS, Windows Phone and Windows is already provided in the specific-impl folder. You can then launch a normal compilation of the project with NeoMAD and the platform-specific sources will be automatically embedded in the generated binary for these platforms. Finally, you can run the generated application in the emulator or on a device and see how it really accesses the compass information. In most cases, the code written using the specific code feature will require libraries that are not available by default with NeoMAD. This may be sytem libraries or even third party libraries. Such libraries can be added to a NeoMAD project thanks to the <specific> tag of the URS. 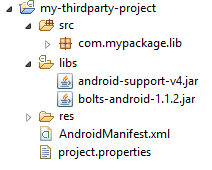 To import a jar in the specific code for an Android target, declare it using the tag <specific><android><library>. To import a project in the specific code for an Android target, declare it using the tag <specific><android><project>. In iOS, libraries can be provided as frameworks or static libraries. Frameworks can be declared in the URS with the tag <specific><ios><library>. They can refer to third party libraries that must be declared with the path attribute, or to system libraries that can be chosen among a defined list under the system attribute. Static libraries can be declared with the tag <specific><ios><staticlib>. In that case, header files must be referenced with the headersFolder attribute. iOS libraries have a status attribute in order to indicate if the library is optional or required. By default it is set to optional. To import a dll in the specific code for a Windows Phone or Windows Store target, declare it using the tag <specific><windowsphone><library> or <specific><windows><library>. For a third party library, the name and the path to the dll are required. For a system library, it can be chosen among a defined list under the system attribute. Replace the <windowsphone> tag by <windows> to perform the same operation for a Windows Store target.